The nurseries are locked down tight~~not a perennial in sight! under cover~~this entire row is sedums! ~~Plants are tucked in to protect them from the freezing nights that have been our late winter weather. I did see a tree that has my heart a fluttering! Isn't she a beauty! She has a hint of H vernalis' yellow hidden in her flower, but the amethyst red petals are the show! There is a touch of fragrance that let's you know that when the sun is out and the day warms up~~she will perfume the garden. I love our native witch hazels. Then, yesterday, I found myself driving v-e-r-y slowly past the grocery store; with my head hanging out the window...(think Leon's rubber neck giraffe) I was looking for a sign that Krogers might be selling perennials. Spring is not ready to sign in! It's kind of nice at home! I hope that signs of spring are beginning to show in your gardening world! Have a delicious weekend! Just keep driving east, over the mountains to Virginia or Carolina. I can assure you garden centers are ready for a visit. Good morning! It's good to talk with you...The wait for spring is forever...I seem to remember saying that last year! I have to tell you...that we are supposed to get snow, not a lot but then really cold weather! No wonder there are no perennials available! It is bleak looking... all the empty shelves! Joy, I can hear a dove in the back yard...they sound so mournful...maybe I can get him/her to pose for a pretty photo! Have a good day! Don't feel too bad, not much out here either & what is has been nipped by the freezes. They don't look very good. I know most of them could be brought back with a lot of care. But I don't wish to pay full price for a damaged plant. So I will wait & see. Good morning Gail, thanks for taking us along, even if there is nothing going on just yet. It does look very colorful at C & L though. I know that a close up of a flower doesn't mean that the whole yard is awash in color, or that's the way it is here. The waiting is so hard. It is pouring rain here, nothing outdoors today except maybe a walkabout if there is a break in the clouds. Keep looking with your head hanging out the window and one of these days there will be something on those shelves! Good morning Gail! Another beautiful witch hazel! I haven't seen them in nurseries around here, but maybe I wasn't looking hard enough. I'll definitely have my eyes open for them this year, especially if they're on sale! They seem to be just a wee bit pricey and I'll be scouting for bargains! Nurseries around here will still be locked up tight for a few more weeks even though there's lots going on behind the scenes in preparation for spring. Good luck on the shade-tolerant evergreens. I'll be interested to see what you're able to find! C'mon to North Florida Gail!! We are beginning to see signs of spring here. Saw a yellow sulphur yesterday in my yard. I love the trip you took us on. The shelves are bare and they are selling the old, tired looking ground covers at full price. Pretty soon we'll see a few beauties that tempt us! Have a delicious weekend. You are so right! I have a few crocus and always happy to bloom...February Gold narcissus, but it is still brown leaves/mulch and brown grass! It is pouring right now; like a Hollywood movie...where the heroine (me) gets drenched as she runs outside to get her wooden handled perennial spade! So glad the cold temps haven't arrived or we would have 3 or 4 inches of snow on the ground right now! have a good day! I was completely surprised to find the Witch Hazel...and it was pricey...more then I wanted to spend. There are a few nurseries(online) that sell many named varieties of H vernalis...but they are quite costly...then there is shipping! But a winter bloomer in a snowy garden would be a delight. Native evergreens for shade are pretty non-existent unless you live further south or in the mountainous areas where native rhodos are happy! have a great day...thanks for posting a link to the form for Spring Fling registration! Lucky you! I haven't seen a butterfly in months..although, I did see a moth yesterday! He'll be gone tomorrow when winter stops by for a long weekend visit. I could use a backhoe, too...to get past the limestone! I do ther same thing...I also buy later then I should...really this month and some of next is the best time for us to add flowers to the gardens. Any plants i put in after April take copious amounts of water all summer long. But I do buy late summer plants that are on sale...put them in a holding area to plant in the fall! I wish the nurseries would stock up for fall planting...they won't! It won't be long Gail. Be patient! You'll be able to help the horticultural economy very soon! Just hang in there. I have a feeling that it won't be long before you start seeing plants. Spring is popping up everywhere! That Ameythyst looks great. A bit of purple in her. Did you get it? Just yesterday in the warmth my daffys began opening. Last year the first one opened on the 2nd of March. Funny these are earlier because the crocuses opened later. I'd say spring is near. That storm last night proved it. It was horrific! Very scary for the dogs too, but not much damage. Have yourself a great weekend. I hope no snow and not too cold. I planted all the cold weather crops so they need to get used to this. In about two weeks, it will change. I'm already seeing the signs here. PDN is having an open house this weekend. I stopped by one of my favorite garden centers to buy the rabbit repellant and they have been busy designing some gardens. There are still violets for sale everywhere around here. There's no better place than your home garden! Can you feel envy across the co-axil cable! I would love to visit PDN! They have a trillium I list after and so many other plants! There is no place like home! The storm woke me up and I wished I had put in ear plugs...the wind was so strong. I didn't purchase the WH...she was over $90 and that wasn't in my budget! Although she is lovely...that particular nursery rarely has sales on trees! We are expecting very cold weather this next few days! I know how much you're appreciating those little touches of color at C&L. I love the beautiful shade of the the Viburnum, and aren't the crocus blooms incredibly sweet? We're expecting rain today today. The temp was 48ºF/8.8ºC on the back porch this morning, but the wind is fierce! The poor woodpeckers are being buffeted wildly as they cling tightly to the suet. I wish that winter was receding just a little bit up there were you live...But that would mean wishing for extreme Climate Change and we don't want that! We had a similar rainy day and fierce winds last night! The crocus has been smashed by it but I enjoyed them while they were here! I hope you have a delightful weekend filled with sunshine and fun. Noooo! Why did you have to post a photo of Hammamelis 'Amethyst'? I'd read about this plant, but how am I supposed to live without it now that I've seen its picture? I have Witch Hazel in orange and yellow. I have not seen the color in your post. I will have to look for that one. Our local Lowes stores did get their packaged plant in. Gail, I may have said this before, but I love those crocus. We're on the wild weather roller coaster too. 70's today, chance of snow flurries later this weekend. A Witch Hazel I'd really like to get my hands on is "Christmas Cheer". I believe it's H. vernalis, and the fragrance is out of this world. Spring is definitely, almost, possibly, here in north Louisiana. Just ask the birds. They're the ones I've been consulting with. The nurseries around here on the other hand, haven't gotten that message. That Spring Beauty (Claytonia virginica) that you pictured looks exactly like the wildflower I picked at a rest stop while driving through Texas last weekend. I thought it was so pretty and dainty that I picked one to bring back and research. Looks like you've supplied the answer for me, thanks! You got me all excited with your mention of a yellow Hellebore, I'd like to get one of those! The Hamamelis vernalis 'Amethyst' is stunning, I can almost smell it through my laptop screen. Your crocus are so pretty, Gail. I feel like there's a biodome of cold hovering over the house--it's ok today (though really windy), but it's supposed to snow by Monday. Lots of buds, but the blooms are still on hold . . . Sigh. It went from +8 to -5 inside of three hours! I am most anxious as I am due to start work Monday at the local nursery here in town. I will try and remember to take the camera and post some photos.... the evidence that we all need that Spring is just around...the next snowdrift! In no time there will be more distracting plants than we can keep track of.... like My Gran used to say...... slow she goes, with gentle moderation! We have daffodils does that count? That witch hazel is something else. I didn't even want one until you and Frances made such a fuss over them. Now I'm going to die if I don't get one. It's definitely nice at your home Gail. Looking decidedly springy to me ~ maybe I can come over? My yard is still bare and brown! Our nurseries and greenhouses are on lockdown too. There is an abundance of house plants, and some spring bulbs but that is IT. ugh. I want some hellebores and can't find one anywhere! Isn't it frustrating? The Amethyst witch hazel would be a beautiful addition to your collection. Will you get it?? Have a great weekend. I have been practically haunting our local nurseries. They are full of spring time color and beauty! I just bought some seeds last week. They were on sale though it's not quite yet time to plant them up in these parts. I just got 6 more inches of snow last night. You've seen the weather out our way already (the hail flood), and tonight we have more snow! I think March is going to come in like a nasty, cranky uncle/aunt you never like to see... but I could be wrong! LOL, Gail; I am picturing you stalking the nurseries:) Actually, Beckie and I did the same thing a few weeks ago when we attended a workshop on seed starting at our favorite garden center. There were a few shelves stocked with seeds and some potting soil but nary a plant in sight! OK, Gail, I am going to blame you if my bank balance dips too low soon--I have fallen in love with that "Amethyst" witch hazel. Pink is my favorite color in the garden; I HAVE to have this plant! I was driving throuhg our Northern Illinois town and checked our tiny garden center for spring yesterday. The center was closed up tight...no flowers....but....in the nursery yard they were unloading bags of top soil, mulch etc.It gave me hope that Spring was coming. Well, here in NC we just started to get our Spring shipments in at the garden center over the last week or so (although some further to the East have a good stock already), and beleive me, we're as happy as you all are when we start getting to see some nice fresh plants arriving! I have never seen that beautiful Witch Hazel before, gonna have to be on the lookout for that one next year. Balisha...our nurseries don't close in the winter...they sell shrubs and trees because winter is a good time for us to plant...and it is only in late january and February that our ground might freeze. I am so glad that spring is beginning to signal its return to your part of the garden! We are waiting to see more goodies arrive at the nurseries! Every day that is warm and sunny finds the obsessed gardeners already wandering around looking longingly at the empty shelves! The witch hazel is a beauty. I bet she's gone when I go back next week! Rose, Hi! Now you are going to be really mad at me...I emailed a witch hazel page to you! The plants are fantastic but very hi priced...maybe you can find it locally! or get it here when/if you drive through our area! When I saw your photos I thought immediately of last year! It was so bad up there...let's hope the cranky relative is just stopping by for a brief visit on her way to some other place! You are a stronger woman than I! Six weeks without plant buying... The upside is NO impulse buying with plenty of time to think about what really makes sense. Claytonia is wonderful...there are front yards all over this neighborhood that are covered with SB for weeks each summer...Mine isn't one of them. I have the shallow soil and limestone of the cedar glade! Witch Hazels are pleasant trees and what I like about this one is that it's a named variety of our native tree...I am excited that folks are seeing their worth. Of course it probably was developed over the pond! You are a stronger woman then me Cindy! How you survive those winters is incredible...I think you are a very strong woman and you love your extended family deeply..or I suspect you and your family would move to a warmer climate! I may be projecting the whole moving thing...i really don't ike cold weather and snow. A haunting we will go! If it weren't raining with more rain forecast I would be over at my favorite nursery right now... Btw, loved your little tree frog! Your grandmother was very wise...and pretty soon spring will arrive and you can show us your beauties...I already want the corydalis you tease me with each time I open your blog! I love this post Gail. I was rubber necking all the way home from TExas. I was so hopeful that I would find a nursery open so I could bring home a nice plant as a trip rememberance but all I found was what you described, covered and or closed. I did manage to bring a couple of pieces of pottery home. Oh I was wishing for driving a truck on vacation. tee hee.. I thought about you as we drove through TN. We drove by Memphis though not Nashville. .....and did any pretties end up in your shopping cart or just the furnace filters? Our furnaces are getting another big workout...are you getting the cold weather this next few days? Boy am I ever glad to see you! I have missed your posts...do you have Witch hazels in your garden? The yellow hellebore is beautiful I must post about it soon! It must have been frustrating...on the other hand pottery is a great addition to the garden! I wish you had been closer...but the weather has been anything but visitor friendly! Cold and wet! Sounds like Ohio! I am so glad you had a good time in Texas and I expect a few posts on the birds you saw! Jean, Glad I could help..there are a few nurseries that sell them..if they like your garden they will seed themselves about...then later in the season disappear! You can't put preemergent weed killer on the lawn or they will die. Sweetbay, That is a new one to me and I am going to google it right now and finish my comment after viewing the images! No luck getting a good image but I will keep looking. Mobot has it in their WH collection...they have over 75! The crocus photo is not bad...are we allowed to say that here in the south! NO but I am a midwesterner from Missouri! Oh that witch hazel looks amazing. I've seen a couple around the garden blogs and I feel pressured to buy one. We are having that roller coaster weather in SE Nebraska, too. It was in the 60s a couple days last week. Right now, late morning, it's 9 degrees with light snow. We had several inches come down in the night. Well the moisture will be good for the plants. Amethyst is truly a gem....wonder just how hardy it might be, hmmmm. Keep on stalking - the best garden prizes go to the one who gets there first - you go girl! You are so correct! I will be there the next warm sunny day! 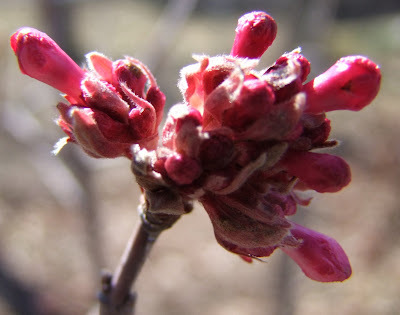 It is a pretty flowering witch hazel~~hardy to zone 5.
lovely things are blooming at clay and limestone i would say spring is on your steps. although with all the cold rainy weather it is hard to feel like it. We haven't got very many signs of spring yet here, but it won't be long now! European growers are usually the folks who develop our native plants...and I think this one may be from there as well. You may actually have an easier time locating the Witch hazel then we do! Gail - thank goodness for all the lovely signs of spring you can enjoy in your own garden until the hurseries catch up with you! We've gone from spring back to winter today, but it's lovely to enjoy the unexpected snow. Hopefully the daffodils, crocus, and snowdrops will manage OK.
Spring is definitely around the corner. Wow, that H. vernalis 'Amethyst' is just fabulous. I'd happily have that in MY garden, but it likely wouldn't be hardy. Sigh. I'll just ogle this one instead. Well, your early flowering plants are a lot more fun than the local stores anyway. I like that Pink Dawn Viburnum! I did notice last week that Lowe's had gotten in a big shipment of plants. Wonder what happened with the 5" of snow from yesterday or the 9 degree temperature expected for tonight.